The Arden Fair Mall closed its doors Sunday, March 3 due to demonstration by protesters outside. Members of Sac State's Black Student Union entered the mall Saturday and refused to leave overnight. 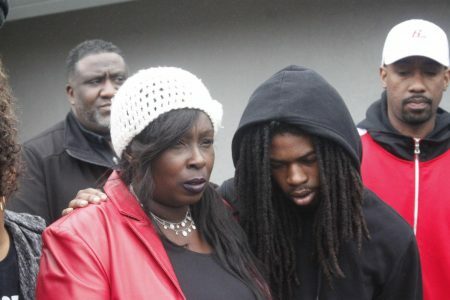 In the days following Sacramento District Attorney Anne Marie Schubert’s announcement Saturday that no criminal charges will be filed against the two police officers who shot and killed unarmed 22-year-old black man, Stephon Clark, last March, protests, demonstrations and overall conversation have erupted across Sacramento. Schubert’s announcement came in the form of a press conference, one that sparked controversy due to its inclusion of intimate details about Clark’s text message exchanges, internet search history and drug use. In the four days since the original announcement, Sacramento State students — including members of the Black Student Union and The State Hornet’s co-news editor Will Coburn — were among the 84 arrested at a Monday protest in East Sacramento. President Robert Nelsen’s spring town hall was replaced with an event in the University Union, with performance art honoring Clark. Sac State and BSU are hosting “spaces for healing and discussion” all week. In light of the district attorney’s decision — supported by California Attorney General Xavier Becerra’s announcement that his office’s independent investigation into the shooting concluded that no criminal charges can be sustained — events and protests have been planned all across the city for upcoming weeks. Since then, Sacramento Chief of Police Daniel Hahn announced that the US Attorney’s Office and the FBI, in conjunction with the Civil Rights Division of the US Department of Justice, will examine if the shooting involved violations of Clark’s federal civil rights. In the time since Schubert’s announcement, in the midst of public backlash and reactions, the Clark family has held multiple press conferences where they have expressed their own views. Immediately following Saturday’s announcement from the Sacramento District Attorney, an initial press conference was held at their family home in Meadowview. In a separate press conference Sunday, Clark’s older brother Stevante Clark announced that there will be a weekend-long celebration held to honor Clark’s life. The Stephon Clark legacy weekend will be held from March 15-18 and will feature a mothers’ brunch, teen summit and a day of remembrance. The Clark family was issued no warning about details of Clark’s text messages and internet search being released to the public, Stevante said. Protesters marched through Sacramento’s Fab 40’s neighborhood, a collection of upscale homes. The protest was organized in response in the Sacramento District Attorney’s decision not to charge the officers involved in the fatal shooting of unarmed 22-year-old Stephon Clark. Sacramento State students, journalists and religious leaders were among the confirmed 84 arrested at Monday night’s protest that started at the Trader Joe’s on Folsom Boulevard and eventually moved into the upscale neighborhood known as the Fab 40s. Among those detained were between 10 and 20 members of BSU, said Khalil Ferguson, a Sac State international relations major and one of the campus BSU’s founders. 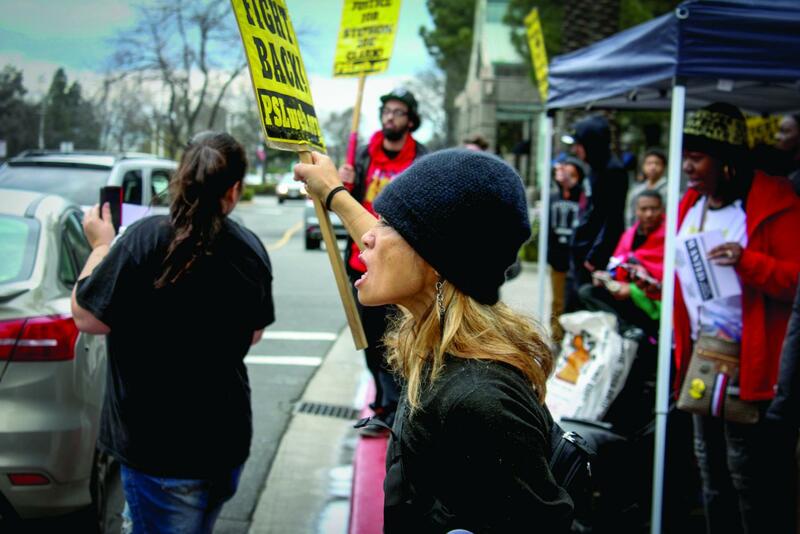 The protest was organized by Sacramento activist group The Table in response to Saturday’s announcement by Sacramento District Attorney Anne Marie Schubert. While unconfirmed, it is rumored to have been said by officers on the scene that the mass arrest was the largest in the department’s history. Those detained were released at Cal Expo between midnight and 2 a.m. in waves of one to six people. Community members, friends, family and activists waited at the “California” sign at the main gate in anticipation, and cheers and applause followed every time a group of newly released detainees made the reported half-mile walk to the area where everyone was stationed. Pools of cars began parking around the island in front of the “California” sign dropping off provisions and blankets. Others came to offer rides back those who left their cars near the initial march route or back to their homes. According to Sgt. Vance Chandler, spokesperson for the Sacramento Police Department, a crowd first began gathering around 6:30 p.m. at Trader Joe’s. As the night continued, protesters moved through the Fab 40s. Police made “at least 10 announcements” for protesters to disperse over a two hour period, Chandler said. 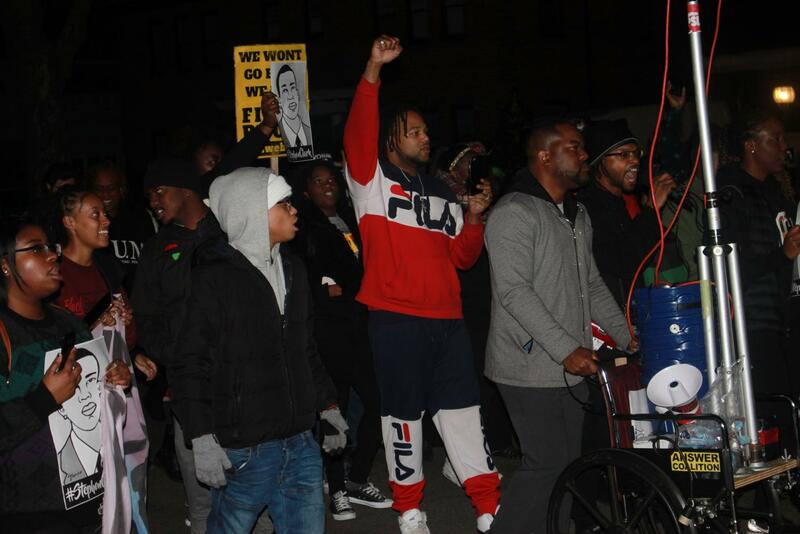 “We need folks to still be free and not in jail when the next action comes. It’s time to disperse, it’s time to disperse,” an unidentified protester said over a megaphone. As minutes passed, police would push the crowd forward as they continued to make arrests. By the time most of the crowd dispersed into the homes next to Folsom Boulevard, they were about three blocks down. Sacramento police set up body barricades between Trader Joe’s and a CVS Pharmacy, not allowing more protesters and those watching to join the crowd, including Tanya Faison, founder of the Sacramento chapter of Black Lives Matter. In addition to Coburn, The Sacramento Bee news reporter Dale Kasler and Sacramento Business Journal law and policy reporter Scott Rodd were arrested on the scene of the protest. Kasler was released, while Coburn and Rodd were not. Coburn was released around 2 a.m. after spending approximately five hours in custody. Coburn said he was taken to a processing center near Cal Expo after being detained with others on an overpass in East Sacramento. Founder of Voice of the Youth and community leader Berry Accius leads a chant at Arden Fair Mall in Sacramento Sunday. 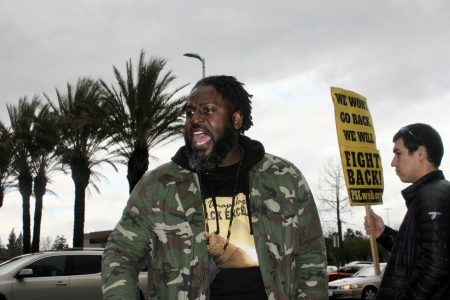 Accius was involved in organizing Sunday’s protest, a response to the Sacramento District Attorney’s decision not to charge the officers involved in the killing of Stephon Clark. Arden Fair Mall was closed to the public Sunday after a crowd gathered in protest of the decision not to charge the two policemen who shot and killed Clark. The closure followed an overnight sit-in and teach-in organized by university students, among which were members of Sac State’s BSU. Ferguson was at the mall Sunday morning after staying the night. 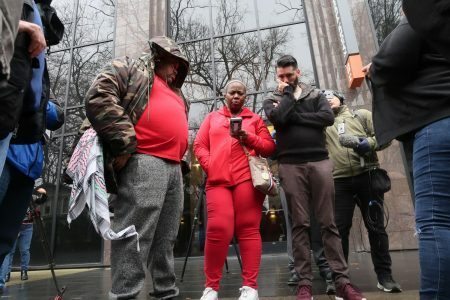 From left, Adam Jordan, Sonia Lewis and Patrick Durant wait outside the Sacramento District Attorney’s office Saturday, March 2 as they watch a live video feed of the announcement regarding the fate of the officers involved in the shooting death of Stephon Clark last March. The officers will not be criminally charged for fatally shooting Clark, according to Sacramento District Attorney Anne Marie Schubert. Following the announcement, Black Lives Matter Sacramento and supporters gathered in front of the Sacramento Police Department. Crowds shouted “no justice, no peace” as they moved from one location to the other. Members of “A Memory, A Monologue, A Rant, and A Prayer,” perform at the University Union Ballroom Monday. The phone number in the background connects to the National Suicide Prevention Lifeline. The university replaced its spring town hall with an event in the University Union Monday to address issues stemming from the recent news surrounding Clark’s death. There will be designated community healing spaces in the MLK Center in Lassen 2201, on Wednesday and Thursday of this week, with Friday’s session held in the Multicultural Center in University Library 1010. Faculty and staff will be on hand to counsel students. 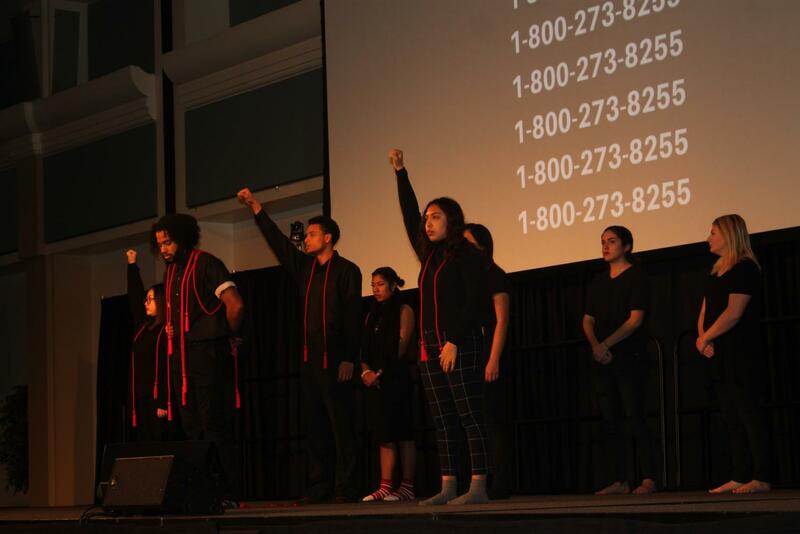 A healing circle and a teach-in were held Tuesday in the Multi-Cultural Center. Moments of silence were given to those who have lost their lives at the hands of police brutality and for Sac State students who were detained during Monday’s East Sacramento protest. “The weight and pain of this weekend’s decision regarding the police shooting of Stephon Clark is too heavy to ignore,” Nelsen said at the event. Students who were involved in the protest and were present at the healing circle and teach-in explained what it was like to be surrounded by police officers, in what some have described as kettling, a police tactic for controlling large crowds during demonstrations or protests by limiting the crowds’ available movement to a small area. Sac State business major Jermaine Gregoire praised the school’s initiative but expressed a need for change with regard to police conduct. “What the school is doing is stepping up and opening people’s eyes. I’ve seen this stuff my whole life,” Gregoire said. Margherita Beale, Mitchel Bobo, Eucario Calderon, Will Coburn, Robyn Dobson, Jose Fabian, Shaun Holkko, Eric Jaramishian, Kelly Kiernan, Claire Morgan, Jonathan Nack , Clarissa Pacheco, Storm Ray, Francina Sanchez, Andres Sanchez, Kameron Schmid, Jordan Silva-Benham, Reanna Simmons and Janelle Williams contributed to this report.